NoiseFree™ Pro automatically removes or reduces any kind of constant background noise like hiss, surface noise, hum, or camera sound. Due to the Algorithmix® proprietary, psycho-acoustically optimized noise reduction algorithm, NoiseFree™ Pro efficaciously preserves timbre, ambience, and low-level details of the original signal, as well as highly reduces the appearance of artifacts. On one hand, it can be used for high-resolution re-mastering tasks. On the other hand, it is a real weapon in cleaning up critical speech recordings for forensic purposes. One quite common problem in the daily business of an audio engineer is a noisy signal. The standard methods of noise extraction by means of filters do not work if spectral components of noise overlap the desired signal. In such situations the only solution is to use sophisticated signal processing algorithms to suppress unwanted noise in a much more intelligent way. The NoiseFree™ Pro DirectX PlugIn effectively removes broadband noise from pre-recorded audio material. It has been designed to perfectly cover a wide range of applications: from the high-quality de-noising of valuable music treasures, to cleaning location recordings for film from environmental noise, even the treatment of critical forensic material recorded at a very poor signal-to-noise ratio and/or in reverberate environment. Typical tasks for the NoiseFree™ Pro include removal of tape-hiss, surface noise of old records and wax cylinders, broadcast noise, microphone and preamp noise, as well as enhancement of conversations and interviews that lack intelligibility. Unlike other systems, the NoiseFree™ Pro DirectX PlugIn works virtually without artifacts when using the correct settings for all parameters. The de-noising process can work based on either the built-in white noise profile or a recorded noise profile. The unique Learn algorithm allows recording a noise sample from virtually any part of audio material, even if there is no noise-only part available. A sophisticated 5-band Noise Profile EQ is provided for modifying the shape of noise profiles and smoothing them for optimal performance. The parameters Ambience recovery and Decorrelation allow fine tuning the NoiseFree™ Pro to differentiate between noise and sharp signal transients. The Chase function--mainly designed for speech de-noising--automatically detects any fluctuations in the background noise and adjusts the Noise Profile according to these changes. 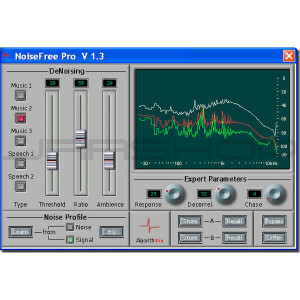 NoiseFree™ Pro works impeccably with sampling rates up to 192 kHz. Thus it is perfectly suitable for hi-res DSD post-production. Since the CPU requirement for the NoiseFree™ Pro DirectX PlugIn is quite low, you can change and optimize all parameters while listening to the audio material in real-time.